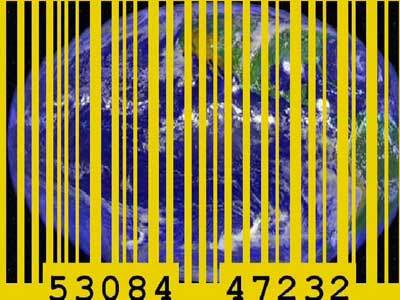 The Golden Age of Barcodes has been shown in Australia, Germany, Obsession Festival in Istanbul, Detroit Museum of New Art , Bayennale(Oakland/SanFrancisco), London, FILE 05 in Sao Paolo and Rio, and is archived on Rhizome.org of the New Museum, NY, NY.. It is an ongoing series and project also included in Istanbul Contemporary Art Museum's WebBiennial, on Furtherfield.org, Thailand New Media Art Festival 2005, and widely viewed from dionlaurent.com . A Call for images for an in-progress project to be announced soon. Blaine Flewin for the use of his song "Metallic D.N.A." from his album Feast on The Horizon. Darren Meeks for programming assistance. Joseph McElroy and Lewis LaCook for technical assistance. All text, images and web pages at Dion Laurent.com are Copyright Dion Laurent 1990-2006. Use of any content without prior written consent of Dion Laurent is expressly prohibited. All rights reserved.